Max Frueh began volunteering with the Friends of the Oak Park Conservatory in September 2012. 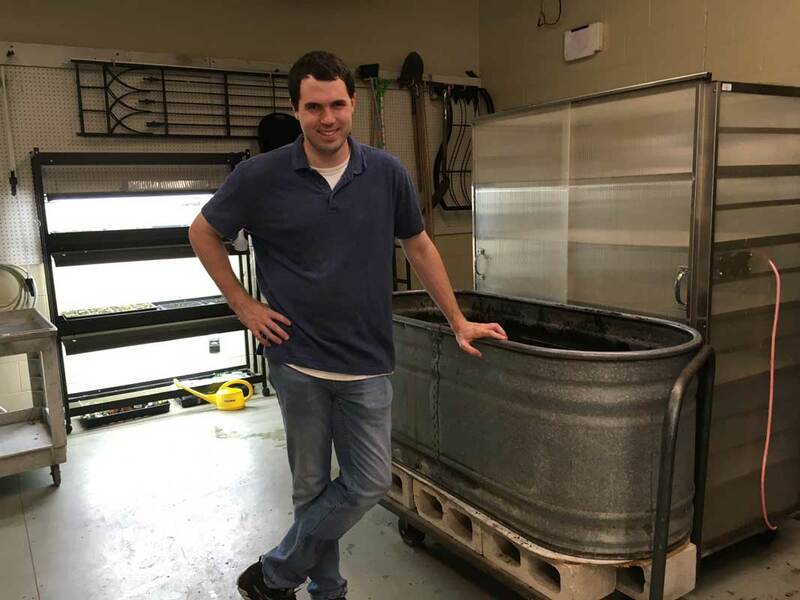 For the past six years, Max has dedicated his time to our pot washing station where he ensures that all of our newly potted plants have a clean environment in which to grow. Washing pots, which is a lot like washing dishes, is a necessary and essential part of caring for plants at the Conservatory. Max takes his role very seriously and we depend on him a great deal. He started volunteering to get out and meet new people. He also likes to help other people. Max also makes sure to give a monetary donation each time he volunteers. He enjoys volunteering at the Conservatory because he gets to visit the showrooms, see his friends and visit with the birds. Other jobs that Max enjoys are as a busman and waitress assistant, at the Blue Max Cafe. He also works in the dining room at Brookdale Senior Living, serving coffee, as a busman and waitress assistant. Next time you visit the Conservatory, stop by and say hello to Max!